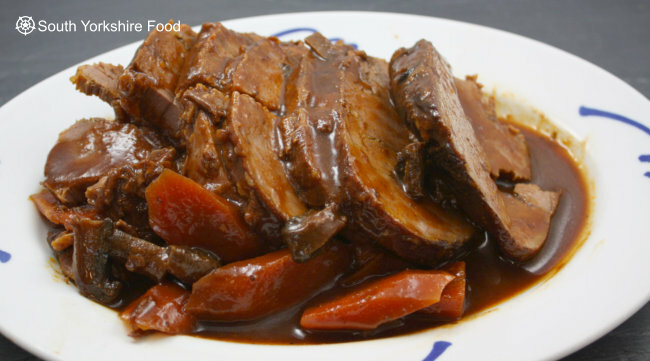 Brisket that has been slowly braised for hours in a low oven to give you tender meat and a rich red wine sauce . What could be better on a cold winters day than this heart warming dish served with creamy mashed potatoes. Serves: 6-8. Heat the oven to 150°C/130°C fan/300°F. In a heavy flame proof casserole dish, heat the olive oil over a medium heat, and brown the brisket joint on all sides. Set the meat aside. In the remaining oil and meat juices gently sauté the onions until they start to soften - about 5 minutes. Add the remaining ingredients, and a few twists of freshly ground black pepper, to the casserole dish, and place the brisket joint on top. The liquid should only come part way up the joint. Cover the dish and cook in the oven for 2½-3 hours, basting the joint occasionally, until the meat is beautifully tender. Check the seasoning, then slice thickly and serve on a warmed plate, with the sauce poured over the top, and a side dish of creamy mashed potato.